Summary: What a letdown! I had hoped EDP could announce the conclusion of its strategic review within these results, but no such luck I’m afraid. Instead, shareholders have been left in the dark about possible corporate action as the underlying business puts in another dismal revenue performance. The irony is this company actually develops software for others to improve sales! I can only hope 2017 will see a generous buyer emerge and I can then move on. I continue to hold. I had hoped these results would coincide with some news about EDP’s strategic review. Unfortunately for shareholders, eight months of assessing “various strategic options” has not yet reached a conclusion. I must say, it’s very disappointing nothing of more substance was disclosed. I suppose I could daydream about EDP being so inundated with juicy buyout interest, that the group is currently bogged down in a protracted behind-the-scenes auction. On the other hand, enquiries may have been scarce and EDP is at a complete loss with what to do with its two main divisions. Either way, I’d like to think the trio of North American ‘activist’ funds that own 29% of the group — and which presumably prompted the strategic review in the first place — will only be happy with a decent buyout result. I mean, these funds can’t really dispose of their holdings in this illiquid £9m company in an orderly fashion — and so some sort of corporate action is their only chance of an elegant exit. For now at least, I trust the right deal comes along soon — perhaps before Christmas 2017! Lacklustre interims in June had already suggested these full-year numbers would be far from spectacular. In the event, the figures were even more underwhelming than I had expected. Revenue dropped 4% after “a small number of customers” delayed orders towards the end of the year. The overall top-line — at just less than £5m — was EDP’s lowest since 1985. At least the group’s recurring income — comprising of annual software licences and hosting subscription fees — was flat at about £4m. Furthermore, management claimed one of the delayed orders had since been converted and that current revenue was “slightly ahead” of the level seen this time last year. Sadly EDP’s profit followed revenue lower, although exactly how much lower depends on which numbers you look at. You see, reported operating profit before one-off property costs fell £70k to £307k. However, EDP said its “adjusted” operating profit fell £29k to £430k… while my own re-jigged measure fell £77k to £453k. Complicating matters in deriving EDP’s profit are various restructuring costs, “exceptional” legal and professional fees, as well as certain IFRS pension charges with no associated cash expense. I have given up trying to keep an exact history of EDP’s profit adjustments, but it seems 2016 was the firm’s least profitable year since 2006. Last year witnessed the group’s aggregate depreciation and amortisation charge very nearly match the net cash spent on tangible and intangible assets. The year also saw a favourable inflow of working-capital cash. All told, EDP produced enough free cash to just about cover the £645k/5p per share dividend. The balance sheet was left with no debt and cash of £5.4m, which could now stand at £6.6m/52p per share following the sale of the group’s sole surplus property the other month. Another notable entry was deferred income — in this case, upfront licence payments from customers for services yet to be received — which edged a fraction higher to almost £2.1m during the year. That improvement suggests near-term revenue is not about to drop very suddenly. Meanwhile, EDP’s pension fund was said to sport a £3.9m deficit, but — long story cut short — that deficit is due simply to IFRS accounting quirks. The results small-print continues to confirm the pension scheme is fully funded and requires no company contributions. Taking my version of adjusted profit — £453k — and applying standard 20% tax gives earnings of about 2.9p per share. Then adjusting EDP’s market cap for the group’s cash and deferred income, I arrive at an enterprise value (EV) of £4.7m or 38p per share. The P/E on my EV and earnings calculations is therefore 38p/2.9p = 13. A 13x rating looks very pricey for a business that has been shrinking for years, but the prospect of the strategic review leading to a trade sale probably justifies the share price. You see, I am quite sure an interested bidder could easily fire EDP’s woeful boardroom — saving £400k a year — as well as remove various quoted-company costs — perhaps up to £100k a year. All of a sudden, EDP’s profit could double under different ownership and the valuation rating could then be in the single digits. This entry was posted in Electronic Data Processing, My Shares and tagged EDP, Electronic Data Processing on December 20, 2016 by Maynard Paton. Following today’s results and with the strategic review still ongoing and EDP still abiding by stock-exchange bid rules, I thought it was appropriate to update the current shareholdings. Oh dear — the strategic review is not going as well as I had hoped. Long story cut short: ELEVEN months on, EDP owns up to currently holding early-stage talks with just the one interested bidder. Other interested parties have walked away, due in part to unfavourable movements within the group’s final-salary pension scheme. In advance of the Company’s annual general meeting on 21 March 2017, the Company would like to take the opportunity to update Shareholders on the strategic review process and also to inform Shareholders about the Group’s defined benefit pension scheme. On 18 April 2016, the Company announced the initiation of a strategic review which included the commencement of an offer period under the Takeover Code. This included a review of the various options open to the Company to maximise value for its shareholders, one of which was the possible sale of the Company. The initial part of this review concentrated on an evaluation of the options, however following the announcement a number of approaches were received and the Board decided to explore the sale option with the objective of unlocking value for shareholders. This decision was followed by a period of several months which involved a structured process based on the sharing of an information memorandum and meetings with a number of parties. This process was impacted by the uncertainty for parties arising from delays outside the Company’s control experienced during the proposed sale of a surplus freehold property in Milton Keynes that had been marketed for seven years. On 12 October 2016, the Company announced the exchange of contracts for the sale of that property for £1.2 million. The sale subsequently completed on 13 December 2016. Around the same time, the Company entered into more detailed discussions with one party involving access to further due diligence. This text reads as if the board has spent most of the last ELEVEN months meeting potential bidders instead of devising a new strategic plan for the business. I suppose it is encouraging to know EDP has attracted some vague bid interest, but it is not encouraging to know there may not be a Plan B ready if that bid interest comes to nothing. One of the key aspects of that due diligence was the Group’s defined benefit pension scheme. As reported in the preliminary announcement of results on 20 December 2016, the scheme actuary had commenced an updated triennial valuation as at 31 July 2016 which is required to be finalised by the end of October 2017. Due to the discussions relating to the possible sale of the Company, the Board accelerated the timing of the preliminary actuarial valuation report. At this preliminary stage, the work has revealed an adverse movement in the actuarial valuation of the scheme. As described further below, work is continuing to complete the valuation. The party referred to above has withdrawn from the discussions. The Company has received an approach from another party, however the process is at a very early stage and there can be no guarantee that these discussions will lead to an offer for the Company. Shareholders will be updated in due course. It is not clear whether the very interested potential bidder walked away because of the pension situation or because of something else. Whatever, I presume the pension situation did not help. What is a tad concerning now is that there is only one possible (early-stage) suitor left… and that suitor now knows it is the only potential suitor at present. A generous offer would therefore seem unlikely. On 20 December 2016, the Company announced its preliminary results for the year ended 30 September 2016. Included within those results was a disclosure that the accounting liability under IAS 19 associated with the Group’s defined benefit pension scheme had increased from £2.27 million to £3.88 million before deferred tax and this amount was reflected in the Group balance sheet. This movement was principally due to a continuing fall in corporate bond yields which are used to value the liabilities in the scheme. Valuing the scheme under the accounting rules prescribed by IAS19, net assets since 2009 have been reduced by £3.38 million. The steady fall in corporate bond yields since 2009, which reflect the low interest rate environment that has prevailed over that period, has resulted in the discount rate assumption falling steadily, from 5.7% in 2009 to 2.2% in 2016. It should be noted that any subsequent increase in interest rates and recovery in bond yields would, inter alia, lead to an improvement in the IAS19 position of the scheme. In contrast with the IAS19 valuation, the last triennial actuarial valuation of the scheme, which was performed at 31 July 2013, showed a small surplus on an ongoing funding basis. This meant that as a result of the scheme being fully funded on this basis, the Group was not required to make cash contributions into the scheme. The assets of the scheme are held in a with-profit Grouped Funding policy issued by Guardian Assurance plc. The main difference between the IAS19 valuation and the ongoing funding valuation is that IAS19 requires the Grouped Funding policy to be valued at its discontinuance surrender value at the period end. Conversely, the ongoing scheme funding valuation values the Grouped Funding policy actuarially and takes into account the guaranteed annuity rates secured under the policy. This was already known, too. The preliminary actuarial valuation report received from the scheme actuary indicates a deficit as at 31 July 2016 of £490,000 (representing a funding level of 94%) compared with a surplus of £62,000 (representing a funding level of 101%) in 2013. This movement arises due to a number of factors in addition to the expected normal experience gains and losses and the impact of changes in assumptions. These additional factors include a technical inconsistency which has been identified between the approaches used to value assets and liabilities in the previous valuation and an adjustment relating to certain pension benefits. The deficit as currently identified in the preliminary valuation report suggests a 10-year scheme funding cash contribution of £75,000 per annum. These amounts are provisional and subject to further review and analysis. Once the valuation is finalised, shareholders will be updated accordingly. Whereas before, shareholders were led to believe the pension scheme’s with-profit policy would cover the scheme’s liabilities with no further contributions, it seems a “technical inconsistency” and other “additional factors” have been unearthed and now require EDP to inject £75k a year into the scheme. Given my sums in the Blog post above point to an annual adjusted operating profit of £453k (and no pension contributions), a £75k annual pension contribution suddenly becomes a notable drawback. The valuation of the pension scheme for statutory accounting purposes, and which is included in the Group balance sheet, is based upon the most recent full actuarial valuation of the scheme and updated on an IAS 19 basis at the reporting date. The current uncertainty surrounding the 31 July 2016 actuarial valuation, which is not expected to be finalised for several months, may impact subsequent IAS 19 valuations and further affect the Company’s distributable reserves. As reported in the Company’s published annual report and accounts for the year ended 30 September 2016, the balance on the profit and loss reserve was £2.64 million. To derive the Company’s current level of distributable reserves, the balance on the treasury share account of £0.59 million has to be deducted along with the proposed final dividend of £0.38 million, resulting in distributable reserves of £1.67 million. The implication here is that EDP’s distributable reserves — which allow the company to pay dividends — may soon become depressed further by the accounting pension deficit becoming larger. EDP’s annual dividend is 5p per share, which translates into £631k. EDP’s figures suggest its distributable reserves may soon be running at £1.67m less £0.59m less £0.38m = £0.7m. As such, were the accounting pension deficit to suffer an unfavourable movement of £0.7m or more, then technically EDP may not be able to declare a dividend. Bear in mind that the aforementioned “technical inconsistency” and “other factors” have already reduced the scheme’s deficit on an ongoing-funding basis by £552k. I must admit, the situation does not appear great. That said, I should add that this distributable-reserves issue is not the end of the world. One or two other companies have already been caught out by enlarged pension deficits and reduced distributable reserves, and have had to skip/delay a dividend. But from what I can recall, companies can re-jig their reserves to fund a payout when distributable reserves become too low… but the process is not quick. It might even involve approval from the authorities. Should the recent approach referred to above not result in an offer being made for the Company, then, subject to the constraints on distributable reserves and rules of the Takeover Code, the Board intends to consider returning an amount of cash to shareholders. The Company will update shareholders when it is in a position to. The Board remains focussed on maximising value for its shareholders from a robust cash generative business model and a strong debt-free balance sheet. At 28 February 2017 the Group’s cash balances were £6.56 million. The board is confident in the on-going execution of its strategy. If you exclude the proceeds from the recently sold property, the cash pile is about the same as it was in the latest results. Finally, I would find the line “The board is confident in the on-going execution of its strategy” quite hilarious if I did not own shares in EDP. You see, the current ‘strategy’, such that it is, has seen revenue recently hit a 30-year low and profit slump to possibly a 10-year low. Following this announcement, I managed to sell some of my holding at about 68p but liquidity soon dried up and I appear to be stuck with the rest. As such, I can only hope EDP’s active investors and other outside shareholders — which combine to represent around 40% of the share count — start to kick up a stink and ensure this protracted strategic review soon comes to a satisfactory conclusion. Olesen Value has added 5,000 shares to take its stake to 699,696 shares or 5.55% of EDP’s share count. I guess it is encouraging one of the ‘activist’ value funds remains keen on the stock — although the purchase cost just £3k. It would be nice if EDP’s three activist funds bought lots of shares now to help force a profitable resolution to the strategic review. When I saw management provided a recent cash balance figure, I immediately compared it to the 30th Sept 2016 number. As of 30th Sept, the cash balance after the disposal should be £6.572M. If management are reporting a current balance of £6.56M, that means the business actually lost money over the last 5 months. I initially thought this was bad news, so I then checked the interim for 2015 and it showed a £190k fall in the cash balance for the corresponding 6 month period. The same applies for 2014 (which saw another large cash decline) so that would indicate that there is a certain amount of seasonality in the business? Indeed, a mere £12k decline in the cash balance may even suggest that the business has stabilised a little? With regard to the pension issue, at a guess, I would say the situation has improved from when the snapshot was taken in July 2016 (long-term bond rates would have been close to a record high, see https://www.bloomberg.com/quote/GUKG10:IND). With all that said, the margin for safety just looks so fine with this one, I can understand why you cut the position. Thanks for the Comment. I have not summoned the enthusiasm to check previous cash flow statements, but the Sept-to-March cash differentials may be affected by final dividend payments. The stated position at the end of Feb in this latest announcement is before the current final dividend is paid. Yes, a rising bond yield will alter the reported pension deficit. But it seems clear to me errors have been discovered in the scheme calculation and the business is now on the hook for £75k pa contributions. I can understand why most of the interested parties have walked away. 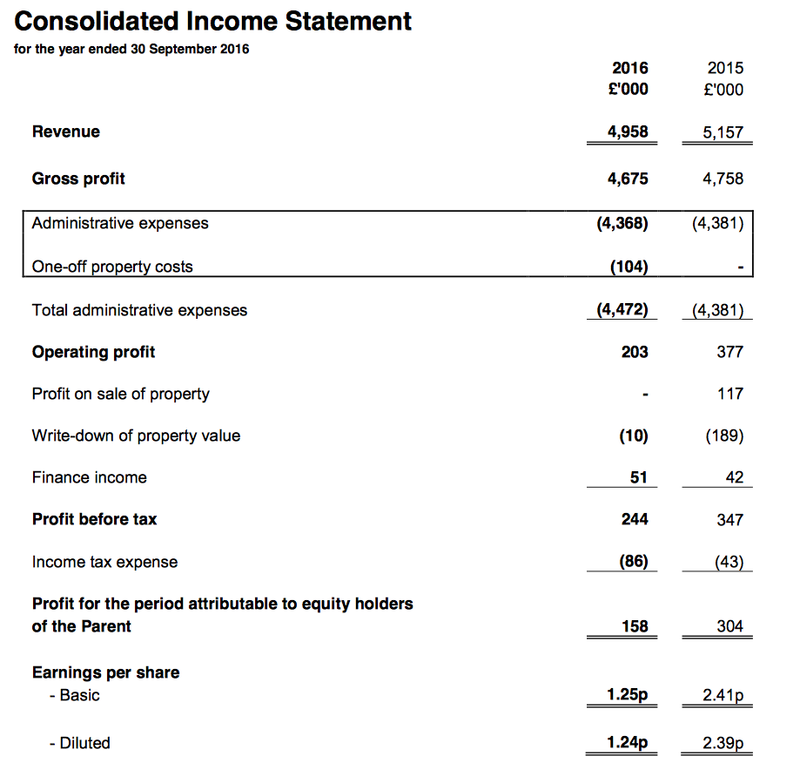 I have checked for you, the dividend hasn’t been taken from the Interim reports in the past few years, so the slightly negative cash balance is surely positive (assuming a lot of cash doesn’t go out the door in the next month?!). I do agree with you though, in the grand scheme of things, the pension deficit here is causing prospective buyers to just walk away. Thanks for checking. You are right, the final dividend is paid in the second half. I can’t recall EDP ever referring to seasonality. Maybe there are more customers renewing their annual licences at the start of the calendar year, which may flatter the cash position. I don’t know. I shall await further developments with interest. So I have just checked my broker account and it appears my limit order to sell the rest of this holding was executed last week. Usually I receive some sort of notification if these orders are executed, but this time I did not receive anything. I did check the trades on the day but it seemed at the time that mine was not executed. Anyway, I am now out completely of EDP at about 67p per share. I shall write a proper update about this investment in the next few weeks.